Bob Anderson's UjENA Fit Club - We can help you get and stay FIT and lose weight! We can help you get and stay FIT and lose weight! The first step in getting or staying FIT is the desire to do so. The second step is getting out the door. The UjENA FIT Club will provide you information on our website and at our Meet-Ups on what do to. We have selected running/walking because it works. It is very addictive once you get passed jogging. Mix walking with your daily run, reduce your sugar intake and you will loose weight. UjENA FIT Club director, Lisa Anderson-Wall running the San Jose Half Marathon October, 2010 Behind Lisa is Roberto who started running two years ago, lost 100 pounds and finished in under two hours. UjENA FIT Club director, Lisa Anderson-Wall started running at the Runner's World Fun Runs in 1975 at age three. (The RW Fun Runs, started by Bob Anderson in 1972, were held at Foothill College in Los Altos, California every Sunday without fail for over 25 years. ) Running has always been important to Lisa. In 2000 she ran the Big Sur Marathon in 3:43. After having three kids and running a company (she is president of UjENA) she found it hard to have enough time to run as often as she wanted like so many others. "I love running and missed it so much. I would run once in awhile always thinking I would get out the door the next day. The next day became years. But I finally got back to it. I ran the Carlsbad 5k three years ago. It was tough not having trained for it but I finished in just over 27 minutes. Last year I got focused and ran the San Jose Half Marathon last October and will be running it again this year," says Lisa Anderson-Wall. "I am now out regularly and loving it. You just have to make time for running. It is that important." "The other evening I went out for a run with my dad and my husband Justin up in the hills. I just love the feeling I get from running. My life is more complete when I am running," says Lisa. UjENA FIT Director, Justin Wall got back into running two years ago. He had never run more than three miles before. He started running regularly, lost over 30 pounds and ran the 2010 San Jose half Marathon in 1:27 at age 40. His coach and running partner Bob Anderson compare splits after the San Jose Half Marathon. UjENA FIT Club Director, Justin Wall was a professional soccer player before suffering a knee injury that ended his soccer career. He married Lisa, came to work at UjENA (he is the VP of Sales), plays a lot of golf (he is a two handicap), but did not think he could run consistently due to his knee injury. "Everyone around me was into running so I decided to go for it, bad knee and all. I have been running 20-30 miles per week for the past 2 years and running has really helped the overall strength of my knee. I am totally addicted to it and am currently training to run the San Jose Half Marathon again this year. Last year I ran 1:27 and hope to improve on my time. Running has become a very important part of my life now," says Justin Wall. The UjENA FIT Club is looking for people who want to be a coach or leader in your area. We are still working out the details for these programs. If you are interested in getting more involved, send Bob Anderson an email bob@ujena.com and share your ideas. At the Ujena races there is always the warmup. It is important to get your body ready to run. GO FOR IT!!!! With just $100 in his pocket in 1966 and never borrowing a dime Bob built Runner's World (RW) into a $25 million company before selling it to Rodale Press in 1984 the current publisher. Runner's World was a major force in moving running into the main stream. This was before the internet and the monthly issues of Runner's World provided information people needed to understand a sport where knowledge helped people reach their goals. RW also published books, newsletters and booklets including Doctor Sheehan on Running which made it to the New York Times best Sellers paperback list. Before selling Runner's World in 1984, circulation had reached 472,000. By far the World's largest running magazine. "I am very much addicted to running and racing," says Bob Anderson. " I started running at age 13 and was hooked right away. At age 17, my whole life was running and in fact I decided to start Runner's World magazine not knowing a thing about publishing. I learned everything along the way and found many others that were as addicted as I was. I sent out a letter to known runners about my idea for a magazine about running and I was amazed at the response. " 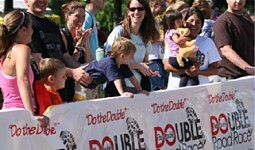 While publishing Runner's World Bob created events that helped bring more attention to running. Back in those early days less than 200 people were running the Boston Marathon. Some of the events that Bob created were the National Fun Run program, 24-Hour Relay, Pre-Race Expos, Corporate-Cup Relays, Marathon Handbook, RW Indoor Classic, RW Shoe Rating, and National Running Week. Jodi loves running and holds the record for the best time for a model in the Bob Anderson 15k Challenge and plans on improving it in Cabo this October. Jodi is a big supporter of the UjENA FIT Club program. She has already purchased 13 $100 FIT Scholarhips. These scholarships will be used to encourage Ujena models to train and participate in the Ujena 5k or 15k in Cabo this October. "Most everything in this world is not free. When I am running through the woods I am wearing a $100 pair of running shoes and $60 worth of running shorts and shirt. Entry fees to races are as much as $100 and to put on a race cost thousands. As a group, we will raise funds and use these funds to help people get and stay FIT. $50 UjENA FIT Dollars we are awarding to the first 70 plus runner in the San Francisco marathon might be just enough to help encourage that person to keep running. Sometimes it just does not take a lot," says Bob. "More than the overall winners in a race are running their guts out and we think recognition is deserved. We will be selecting different age categories and random places in advance of a UjENA FIT Club selected race to award UjENA FIT Dollars," says Lisa Anderson. "What other organization is awarding dollars to people who finish a race other than sometimes their overall winners. It is not a lot of money but sometimes it is the little things that can help motivate people." "I have won $50 cash here and there by winning my age-group over the years. It was not a lot of money, but it was a good feeling to win it. It was like someone really recognized my effort. I win medals and t-shirts all the time and the thrill is different. I think some race directors take their runners for granted," says Bob Anderson. "Of course I run because I love it. However, earning money is something we all understand. We know by doing a good job we make more money. Cash awards are special no matter what amount they are. It's like being a professional athlete in a way and for me that's exciting," says Bob. "For the last 26 years UjENA, a women's apparel manufacturing company, has sponsored and produced the UjENA 5k and more recently we have added the UjENA 10k and the Bob Anderson 15k Challenge. These unique events are held in Mexico and many people have started running regularly because of these events. We award a total of $4800 UjENA FIT Dollars annually at our three events held in Cancun, Puerto Vallarta and Cabo," says Lisa Anderson-Wall, UjENA president. "We have awarded over $20,000 in cash (now called UjENA FIT Dollars) to runners in our UjENA races held at the UjENA JAM," stated UjENA founder and current CEO Bob Anderson. "UjENA will be funding this start up and will continue to support the UjENA FIT Club," says UjENA PR director Catherine Cross. "We hope you will join the UjENA FIT Club and show us your support too. There is nothing more important than getting and staying FIT. This is the sole purpose of the UjENA FIT Club and we need your support to reach our goals." The UjENA FIT Club program centers around running/walking at least one mile every day. When you have time, we also feel that Yoga and light weight training are good to mix in too. The UjENA Fit Club is dedicated to promoting fitness in unique ways. What other Club do you know of that is giving aways dollars to members who run/walk just a mile or more per day? We want you to make running/walking a daily habit. Just login your daily miles into our computer and have a chance to win $50 FIT $$ weekly. Run in a UjENA FIT Club GO FOR IT! selected race and win FIT $$. We are picking some of the best races in the country and will be giving away $50 FIT $$ to winners in different age-groups, categories and to selected finishers. We will be promoting fitness in unique ways. JOIN US!! UjENA FIT Club director, Michael Anderson grew up with running. He has run two marathons, San Francisco and Big Sur and has been running races for nearly 20 years. He has run 37:24 for 10k and 18:07 for 5k. He is training for his third marathon wanting to improve on his best time of 4:09. UjENA FIT Club director, Michael Anderson (in orange) at the start of the Mission 5k in San Juan Bautista, California. Michael runs everyday at least 20 miles per week. "I have been around running all my life. How could you not be a runner in this family? I love it and it has helped me live the life I enjoy. I cannot imagine not running. I am currently running 20 or more miles per week and it is great to get in some of these miles with my dad. Running has helped me get through some very tough situations. It is my key to a better life. I am excited to be part of the UjENA FIT Club," says Michael Anderson. 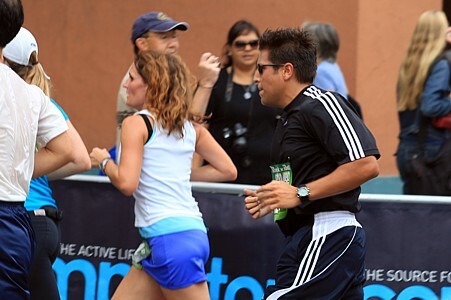 UjENA FIT Club director Catherine Cross pushing it to the finish of a 5k at Stanford. With the encouragement of Bob Anderson, Catherine started running at age 40 and has run a half marthon in just over two hours. UjENA FIT Club director, Catherine Cross is not running now but walking instead. With the encouragement of her partner Bob, Catherine started running when she was 40. She was running 20 miles per week and was able to race 5k in 25:01 and a half marathon in 2:04 before having an issue with her feet. "I love running but right now I am still sorting out some issues with my feet. I am now walking and hiking. I know how important fitness is and even more so since I am now 57. It will always be part of my life," says Catherine Cross. Sitting in front of a computer for long hours every day can really take a toll on your health. UjENA FIT Club webmaster Waitman Gobble found running to improve his energy and make him feel better. He had never run before, but decided in 2006 to give running a try. 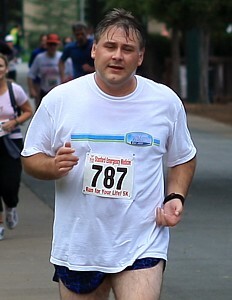 UjENA FIT Club webmaster, Waitman Gobble finishing a 5k race at Stanford. With the encouragement of Bob Anderson, Waitman started running and walking regularly and completed the San Jose Half Marathon. "I got started a few years ago and I love it. I've run several races including the San Jose Half Marathon. I want to get out the door regularly but like so many others a lot of things get in the way. I know the benefits and will continue to make it a part of my life," says Waitman. "So why are we starting the UjENA FIT Club? We are hoping our new club will help people get or stay FIT. All the funds we raise will be used to promote fitness. Funds are not being directed to other worthwhile causes," says founder Bob Anderson. As a member you do not have to post your daily run/walk, attend any Meet-Ups, run any of our races or selected races. You might want to just follow the advice we are going to give you. However, to get the maximum out of your membership we hope you will get involved. Getting out the door and posting at least one mile daily is most important! GO FOR IT!!!! Sign up today...it is FREE to Join.